From the coauthor of the 1 New York Times bestseller American Sniper comes a heart-pounding military thriller in which the fabled domestic Special Ops Black unit is activated in order to stop a group of Chechen terrorists from launching a pair of suitcase nukes somewhere in America. When Chechen terrorists manage to smuggle a Cold War era Russian nuke across the Mexican-American border, the President is forced to reactivate the only unit capable of stopping them Navy SEAL sniper Gil Shannon and his brash team of SEALs and Delta Force fighters. First introduced in Sniper Elite One Way Trip, hailed by Publishers Weekly as a meaty thriller with snappy dialogue and well-timed humor, Shannon and his team were run out of the military after defying direct orders and instead choosing to save the life of one of their own. Scott McEwen lives in San Diego, California, where he began writing while practicing law. He grew up in the mountains of Eastern Oregon where he became an Eagle Scout; hiking, fishing, and hunting at every opportunity presented. He obtained his undergraduate degree in Oregon and thereafter studied and worked extensively in London, England. Scott works with and provides support for several military charitable organizations, including the Seal Team Foundation. Scott's second non-fiction, Eyes on Target, provides a riveting view of the Navy SEALs as never seen before. It also includes a definitive view of why the Benghazi attack was both predictable and preventable, and what should have been done to save the brave Americans killed during the attack. Scott started his first Novel series in collaboration with Thomas Koloniar which resulted in the National and Amazon Bestseller Sniper Elite-One Way Trip. Based on true events, Sniper Elite explores a series of real sniper stories that have been fictionalized in the novel. 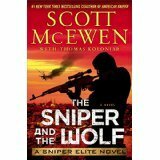 Already critically acclaimed, Target America-Scott's latest book-is the second in the Sniper Elite series. The plot in Target America explores a not-so-fictional result when you release terrorists from Guantanamo Bay. A story that has received national attention, given the reality we have observed as of late. The sniper elite series has been acquired by SONY Films and is being developed for a movie. We will be working with Jaume Collet-Serra (Director) and Sheldon Turner (screen writer) to put the hottest action ever to date on the screen. http://deadline.com/2015/02/sniper-elite-jaume-collet-serra-sheldon-turner-american-sniper-scott-mcewen-1201378070/ We cannot wait!